Dr. Reagan: In Psalm 22:19-21, the psalmist records a final prayer uttered by the Messiah. It is a plea for deliverance from Satan. In verse 19 he writes, "But You, O Lord, be not far off; O You, my help, hasten to my assistance. Deliver my soul from the sword, my only life from the power of the dog. Save me from the lion's mouth; from the horns of the wild oxen. You answer me." Verse 21 ends with a prayer for deliverance from Satan's attack. Verse 22 begins with a song of celebration, thanking God for answering the prayer. "I will tell of Your name to my brethren; in the midst of the assembly I will praise You. You who fear the Lord, praise Him; all you descendants of Jacob, glorify Him, and stand in awe of Him, all you descendants of Israel. For He has not despised nor abhorred the affliction of the afflicted; nor has He hidden His face from him; but when he cried to Him for help, He heard. From You comes my praise in the great assembly; I shall pay my vows before those who fear Him." Dr. Reagan: I praise God for the promise of the resurrection that is clearly inferred in these verses! Incidentally, the most direct prophecy concerning the resurrection in the Old Testament is one that is found in Psalm 16:10 where David wrote, "You will not abandon my soul to Sheol; nor will You allow Your Holy One to undergo decay." 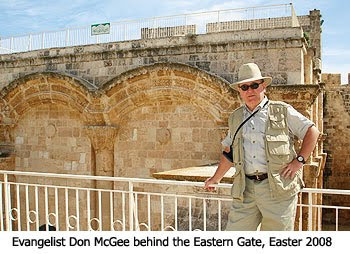 Don McGee: In the New Testament, Jesus repeatedly told His disciples that He would be killed and resurrected. It was one of His most frequently stated prophecies. For example, in Matthew 17 He is quoted as saying, "The Son of Man is going to be delivered into the hands of men; and they will kill Him, and He will be raised on the third day." Luke records the fulfillment of these resurrection prophecies in the following way in Luke 24, beginning with verse 1, "But on the first day of the week, at early dawn, they [a group of women] came to the tomb bringing spices which they had prepared. And they found the stone rolled away from the tomb, but when they entered, they did not find the body of the Lord Jesus. While they were perplexed about this, behold, two men suddenly stood near them in dazzling apparel; and as the women were terrified and bowed their faces to the ground, the men said to them, 'Why do you seek the living One among the dead? He is not here, but He has risen. Remember how He spoke to you while He was still in Galilee, and saying that the Son of Man must be delivered into the hands of sinful men, and be crucified, and the third day rise again.'" In the last part of this series on the Passion in Bible Prophecy, well marvel at how Jesus' victory on the cross is victory for all who accept His saving work on the cross. Great! I have stayed away from following the middle east news, I get too excited and my blood pressure soars - then the news goes flat - and so do I. So I look forward to this. eeeeee! I let Bill Salus himself teach us about Psalm 83 in an interview we did with him on "Christ in Prophecy" - Psalm 83 Explained. "...but with events so hot in the Middle East..."